Potentially explosive methane gas leaking from energy wells may travel extensively through groundwater and pose a safety risk, according to a new study by University of Guelph researchers. Researchers at the U of G-based G360 Institute for Groundwater Research found the gas is highly mobile in groundwater, travelling far beyond the shale wells where it is drilled and changing the water chemistry. It will also escape into the atmosphere as a powerful greenhouse gas. The findings were published recently in the journal Nature Geoscience. Besides posing an explosion risk and degrading groundwater quality, methane can contribute to climate change when released to the atmosphere, said G360 director and principal investigator Beth Parker. 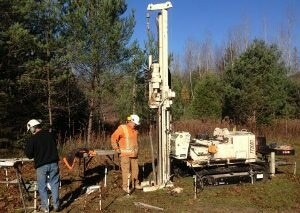 The researchers injected methane over 72 days into a shallow sand aquifer and monitored it for more than eight months at Canadian Forces Base Borden in Ontario. They found the gas travelled through the ground, was sometimes released into the atmosphere and dissolved extensively into the groundwater, where it changed water chemistry. “If this water is extracted, say, by a farmer, the dissolved gas can be released and form an explosion risk or change the taste of the water,” Parker said. The study found only small changes in water quality, said lead author Aaron Cahill, a former U of G post-doctoral researcher. He said the study covered only a short time period and used only small amounts of methane. “For larger leaks over longer times and greater areas, these findings would indicate that the groundwater would become unusable,” he said. Leaky wells could pose a significant danger to the environment in a number of ways, said Cahill, who is now at the University of British Columbia. “Methane is 30 times more potent than carbon dioxide at trapping heat when in the atmosphere, so we need to consider both the air and the groundwater when monitoring for leaks. The impact to groundwater is likely to be long-term and persist long after a methane leak is fixed,” he said. Sealing energy wells thoroughly can be extremely challenging, said School of Engineering adjunct professor John Cherry, co-author of the study. Energy wells run deep underground through many layers of rock and sediment, he said. “When energy wells are constructed, the cement used might not seal fully, or will initially seal but as it matures little cracks can form, allowing gas to escape. While drilling is better than ever before, leaky wells are still common and represent a large liability for the oil and gas industry,” Cherry said. Monitoring of groundwater for methane leaks is rarely done. That needs to change, he said.